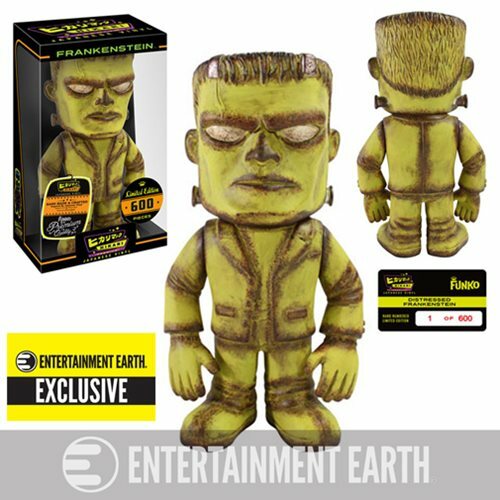 Shopping for Universal Monsters Vinyl Figures? Behold the monster - Frankenstein's Monster! One of the most popular classic monsters ever stands 7 1/2-inches tall in a stunning, decrepit ghoulish paint job. "It''s alive. It''s alive!" Dr. Frankenstein''s creature stands 7 1/2-inches tall and features a premium paint job with white eyes and fading, aging green skin! From his white eyes to his green and brown hair, the Frankenstein monster has been meticulously painted. Limited to only 600 pieces worldwide, this Frankenstein Distressed Hikari Sofubi Figure comes individually numbered and packaged in a window box for easy display. Exclusive to Entertainment Earth in North America. Ages 14 and up.